Clean CARFAX. Free CARFAX Available! Bright White Clearcoat 2016 Jeep Compass Sport FWD CVT 2.0L I4 DOHC 16V Dual VVT Extended Warranty Available, ABS brakes, AM/FM radio: SiriusXM, Audio Jack Input for Mobile Devices, Automatic Headlamps, Electronic Stability Control, Front fog lights, Power Windows w/Driver One-Touch. 22/26 City/Highway MPG Priced below KBB Fair Purchase Price! Get Financing Approved Today! 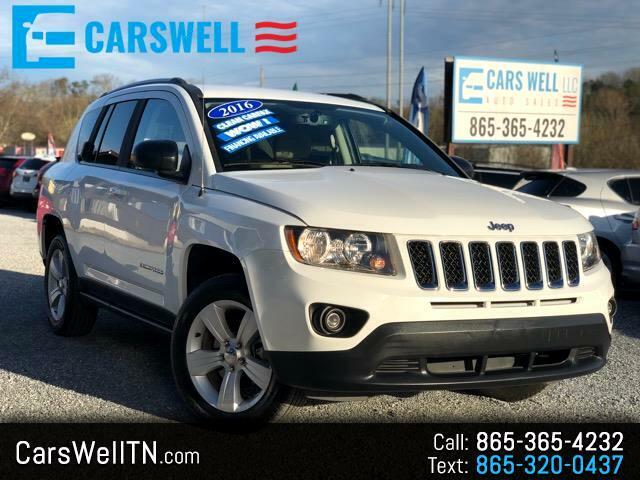 Visit Cars Well LLC online at carswelltn.com to see more pictures of this vehicle or call us at 865-365-4232 today to schedule your test drive. Message: Thought you might be interested in this 2016 Jeep Compass. MUST Finance with Cars Well for this PRICE. Contact dealer for most current information: 865-365-4232. All prices do not include tax, dealer service fee, title, and license. The features and options listed are provided by a vin decoder and may not apply to this specific vehicle.